Roger drove me up to Canberra, where I was to launch my new book at the National Library. We stopped at Rutherglen (where there was an infestation of White-browed Woodswallows) and visited Chiltern (where we saw and heard a pair of Leaden Flycatchers). The next day we stopped at Wonga Wetlands in Albury (where there were lots of Sacred Kingfishers, but I could only find one Azure Kingfisher, and no Red-backed at all). 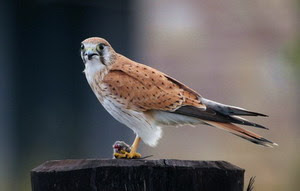 ﻿From Albury, we drove to Cootamundra and spent a happy couple of days birding in the vicinity. We enjoyed Jindalee National Park and had good birding at Stockinbingal, notably a noisy flock of Grey-crowned Babblers at Felix Fallon Bridge. I did the Migurra Walk near Cootamundra a couple of times, but was not rewarded with the usual special sightings. One foolish Black-faced Cuckoo-shrike had constructed its nest very high in a dead tree. It had no shelter at all and the temperature was uncomfortably high. The poor bird must have almost cooked. On the way to Canberra, we stopped at Bowning and admired beautiful Superb Parrots and one lone Dollarbird. Then came my big day. 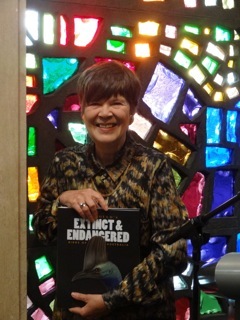 Here I am, at the bookshop in the National Library, holding my new book, "John Gould's Extinct and Endangered Birds of Australia." (The photo was taken by my girlfriend, Helen.) I was honoured to have Joe Forshaw officially launch my book. The National Library has done a stunning job of it, so of course everyone said nice things about it. Now comes all the media attention, and inevitable fame and fortune. Yesterday, Rog and I took my cousin, Liz, and her partner, also Liz, to Werribee for the day. Neither of them had been there before, and while my cousin had a pleasant day doing her sudoku in the back seat, I think it's true to say that each of us had a good time in his or her own way. Some of us even enjoyed the birds.﻿ Melbourne's Western Treatment Plant, about an hour's drive west of the city, is, without a doubt, the top birding site in the state. Highlights for me were excellent views of an Australian Spotted Crake, lots of Banded Stilts, wonderful close sightings of Red-necked Avocets swishing their chic bills from side to side as they fed, and terrific views of several Blue-billed Ducks, true to their name, with the bluest possible bills. I scored two new birds for my annual list: Common Greenshank (how had I missed on these until November I don't know) and Pacific Golden Plovers (sheltering from the wind in the samphire behind Kirk's Point). We had lunch at the borrow pits, commencing with a refreshing bubbly provided by Cousin Liz. Here a fellow birder informed us that he'd seen 55 Freckled Ducks south of Lake Borrie, so, as soon as the bottle was empty, we hurried over to Lake Borrie to scan the ducks. Most of them were pinkies, with a scattering of teal and pelicans, but not a Freckled Duck in sight. Not to be stymied quite so easily, my clever husband drove to a lagoon south of Borrie and quickly and expertly located the Freckled Ducks. I didn't count them, but it was a sizable flock and I'm happy to accept that there were 55. A big thank you to that friendly birder. A lifer for Liz! And a day well spent for us all. Some of us reaped rewards admiring waders, some from completing difficult sudokus. A bottle of bubbly and a couple of annual ticks will do it for me any day. 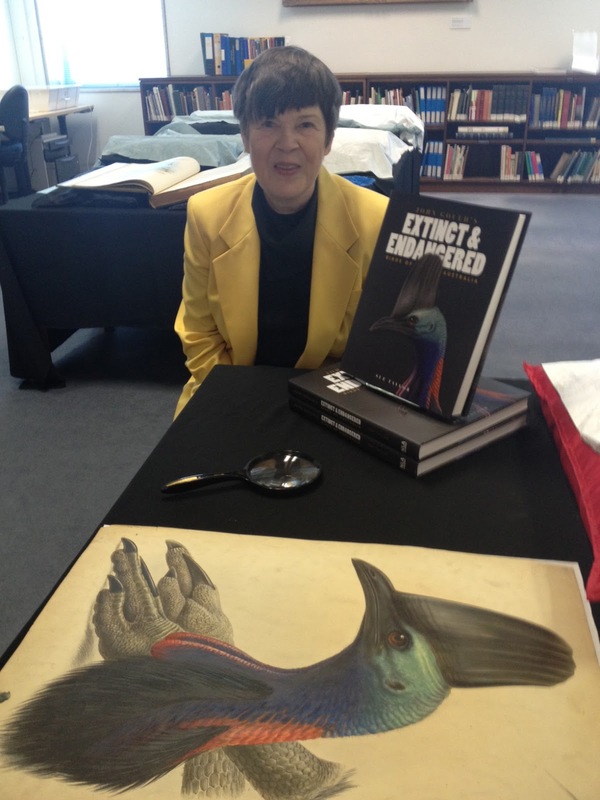 MY NEW BOOK: "JOHN GOULD'S EXTINCT AND ENDANGERED BIRDS OF AUSTRALIA"
What an exciting day I had yesterday! The National Library of Australia flew me up to Canberra to do my very first television interview to promote my new book, "John Gould's Extinct and Endangered Birds of Australia." 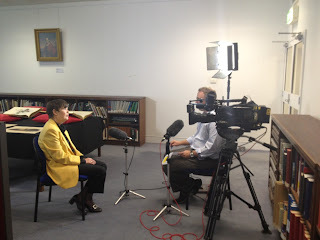 Me being interviewed for television! The National Library had taken all Gould's volumes of "The Birds of Australia" out of archives for the occasion. You can see some of them on the table behind me. We weren't allowed to touch them, but we could admire them, and they were beautiful! Perhaps it's not as much fun as seeing a Franklin's Gull (let's be honest, it's nowhere near as much fun) but it was diverting, and quite a new experience for me.﻿ The interviewer and I chatted for a while and I am hopeful that they can edit it down to something interesting for the viewers, who will all then rush out to buy the book. By definition, vagrants don't turn up every day! How delighted I was to learn that there was a Franklin's Gull at Paynesville, about four hours' drive east of Melbourne. I hadn't been expecting any new ticks this year, but I was excited to have the excuse to look for one. We set off at 9 a.m. and arrived at Paynesville at 1 p.m.﻿ At approximately four minutes past one, we had the bird! A woman had parked her car on the grassy area near the craft shop and was feeding gulls. 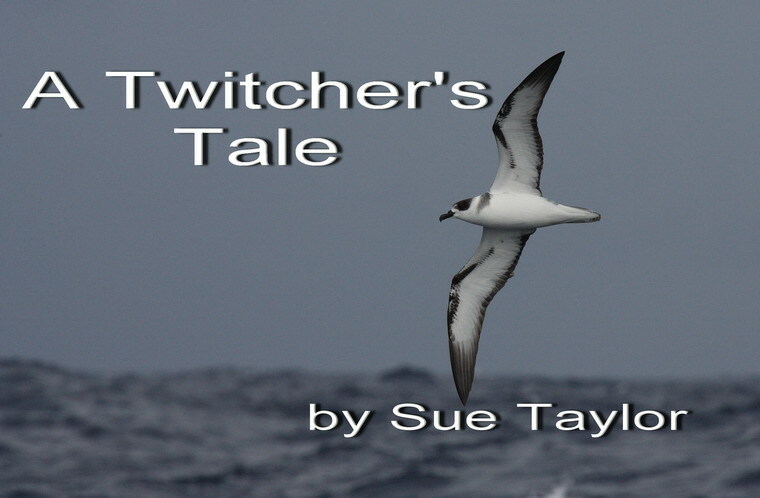 There were about eight Silver Gulls, and one, much smaller, with a darker grey back, black legs and a black head! It was one of the easiest ticks I've ever had. (Although, to be fair, my last tick, the Chiming Wedgebill at Dresley Creek in July was ridiculously easy. Dresley Creek is just a dry creekbed. It doesn't appear on my map. It is located about 100 kilometres south of Coober Pedy on the Stuart Highway in South Australia. I'd heard that there were Chiming Wedgebills there. We stopped by the dry creek and immediately we could hear wedgebills chiming. In about five minutes, I had excellent views. Now that was an easy tick.) We didn't have to drive so far for the Franklin's Gull. I wanted to see the bird's red bill tip and the pattern on its wings in flight, but it was not to be. The woman stopped feeding, the gulls flew off. The Franklin's Gull was lost amongst the Silver Gulls and I didn't get a look at the wing pattern. We were absurdly pleased with ourselves, as if we'd achieved something very difficult, when, in fact, all we'd done was drive to Paynesville and look at a bird right in front of us. Still, it was certainly cause for celebration. Ticks are getting harder these days, and a tick's a tick which ever way you look at it. The last few days I've been busy working on my fourth book (about Australia's best birding sites) which is to be published next year, so I haven't allowed myself the luxury of updating my blog. Now it is the weekend, and I figure I can do what I want! After we ticked the Franklin's Gull (number 719, hooray!) we visited MacLeod's Morass in Bairnsdale, Mitchell River National Park, then Lake Guyatt in Sale (very briefly - looking for Freckled Duck but not finding any) then dropped in at the Sale Common on the way home. It was hot when we visited Macleods Morass. Both the boardwalks and the bird hides were in need of maintenance and there were some trees across the track. I didn't care, there were Glossy Ibis feeding in a swamp by the entrance and a male White-winged Triller made his presence felt. I crept along the track, trying not to disturb the ducks, but somehow they were always aware of my presence before I saw them. A Nankeen Night Heron flew over my head, startled by this unwelcome human. It was very pleasant and there were lots of birds. I walked out on one boardwalk, there was no cover and five White-faced Herons took off together, swearing at me loudly and informing every other waterbird for miles that there was an undesirable intruder present. I persisted and reached the bird hide, only to be rewarded with a large flock of coots and an even larger swarm of mosquitoes. On another occasion, I may have been disappointed that I hadn't seen anything special, but I was still basking in the glory of having seen a Franklin's Gull and it would have taken a lot to disappoint me that day. We drove on to Mitchell River National Park and parked in the Den of Nargun car park. I did the walk to the Bluff Lookout. It was only ten minutes, but it was steep and hot coming back. A Fan-tailed Cuckoo drove me mad, calling constantly, but never visible. I always hesitate to venture off the track, as my sense of direction is non-existent and I am liable to get impossibly lost, however, I had to see that cuckoo. So I bush-bashed my way up the hill, figuring that I couldn't get lost if I simply kept going up. I saw the cuckoo eventually and wondered why I'd put so much effort into seeing such a common bird. But of course I knew: I wanted to put him on my list and I couldn't do that unless I'd seen him. I heard Wonga Pigeons too, but they were further away and I wasn't tempted to risk straying so far. They rewarded me by flying across the track and I wondered if the cuckoo might have done that too, if only I'd been patient. Sale Common is always worth a look. The number of waterbirds depends on the amount of water, but there are always bush birds to entertain you. Rog enjoyed a cup of coffee while I explored the boardwalk. On this occasion, there were plenty of waterfowl, as there was plenty of water. I saw ducks and swamphens and coots and moorhens and a few Great Egrets. A Whistling Kite flew over, whistling. There were reed-warblers and visible Little Grassbirds everywhere. I'm used to hearing Little Grassbirds, but rarely see them. It was a treat to get so many fleeting glimpses. ﻿I believe this was the first time I'd ever visited Sale Common without seeing a Golden Whistler. His rufous cousin made up for his absence. I saw Striated Pardalotes and Silvereyes, a Grey Shrike-thrush and lots of Superb Fairy-wrens. I would have enjoyed a bittern, a crake or a rail, but it was not to be. However, it was still impossible to dampen my spirits, and I went home perfectly happy.